Matt finds out stamping passports is more interesting than it sounds. I looked at the man’s passport and entry permit. He was a foreigner; immigrating to Arstotzka from nearby Antegria. “Glad to be out from under the iron thumbs of those imperialist dogs in Antegria, comrade!” he said. Seems like he’d run into some trouble over there with the government and was escaping east. Not that any of that was my concern, I just do what I’m told. Everything seemed to be in order. I green-stamped his passport and handed it back to him. I rolled my eyes and hit the button to call the next person in line. A woman approached next. She handed me her passport. “Where is your entry permit? All foreigners require an entry permit before they can enter the country.” After the terrorist attack a few days ago, where someone had dashed across the border and thrown a grenade before he could be shot down by the guards, all foreign entrants required a new permit. She did not have one. “Please, you must let me through, I will be killed if I go back to Antegria!” She begged. But that was not my problem. I had already received a citation that day for allowing someone with incorrect passport information through. Another and I would be docked pay, money I needed to buy medicine for my sick family. “No entry permit, no entry.” I said, and stamped her passport red. “You have doomed me,” she cried, and walked dejectedly away from the border back towards West Grestin. I watched her go, it was not my problem. I hit the button. 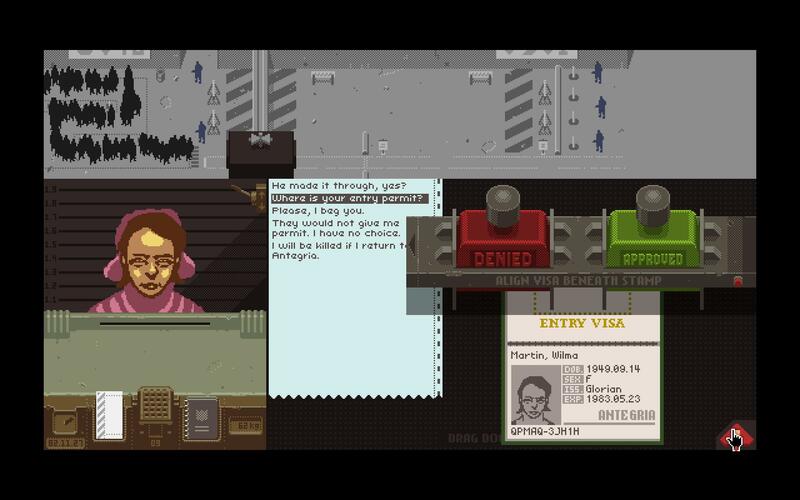 Papers, Please is a “Dystopian Document Thriller” by Lucas Pope, an independent game designer. The beta-version of this work-in-progress is available for free on his website Dukope.com for Windows and Mac. The above scene is one of the many different scenarios you face. In Papers, Please. Despite the lack of high-level 3D graphics and shaders or even voice acting, the game does a fantastic job playing on human empathy. You play an immigration inspector on the border of fictional Communist country Arstotzka and must inspect individuals’ passports and permits for discrepancies, incorrect time-stamps, or fraudulent documents. Some will enter, many will not. And for each mistake you make you can be penalized. Although you’re allowed one or two chances to mess-up (or even break the rules if you feel personally convicted to), many errors can cause you to lose pay, which will then affect your family when you come home after work. You must pay for rent, as well as heat and food. If you can’t pay for something, they can get cold, hungry, sick and even die. With each day new security measures are added, giving you even more aspects of each person’s paperwork you must inspect. As it takes longer to inspect each person and there are more things that can go wrong, you feel the constant pressure not to fail and potentially hurt your family. Oh, and you’re pay is based on how fast you process people, so work quickly. Thus the game forces you to make some difficult decisions. I won’t spoil any of the other encounters you might face along the way, but it goes without saying there will be some tough choices to make. It’s been a long time since a game so simple has found me so engaged with its characters, even though most of them you will only see once, and then never again. This is by no means the first video game to play on the player’s empathetic emotions to achieve a certain style, but it certainly is an effective execution of it. As it’s free, I highly encourage people to try it out and see just what being part of a Communist bureaucracy is all about. This story was originally written for my column “It’s All Geek to Me” in the Daily Titan newspaper.